ARCHAEOLOGISTS SURVEYING LOUGH Corrib in Galway have made what is being described as an “important” discovery of Viking artefacts and logboats. 12 newly-discovered logboats, ranging in date from 2,500 BC to the 11th century AD, have been investigated in the course of a series of dive surveys by the Underwater Archaeology Unit from the National Monuments Service. The initial discovery of the logboats was made by Trevor Northage of www.anglingcharts.com, a marine surveyor, who is mapping the lake to produce up-to-date and accurate navigation charts. Heritage Minister Jimmy Deenihan said that one of the boats may have been on a raid when it sank as it contained a selection of 11th-century weapons, including three Viking style battle-axes with intact wooden handles, an iron work axe and two iron spearheads. The three battle-axes will be centre-pieces of the National Museum’s Battle of Clontarf exhibition, which is launched tonight. He also confirmed that the National Museum of Ireland is supporting the project by taking on responsibility for care and conservation of all recovered artefacts. If you’re thinking of diving the sites yourself, however, the Department reminded people that a special licence is needed. 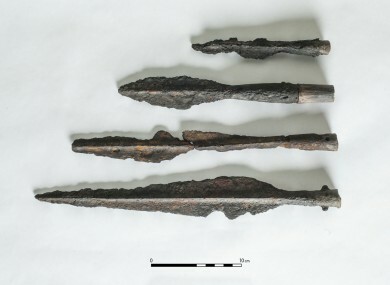 Email “These Viking artefacts and logboats have been found in Galway”. Feedback on “These Viking artefacts and logboats have been found in Galway”.